As Jess Larson ’21 stepped into the warm tank of water, sting rays began brushing at her feet. Grabbing a handful of fish, she dipped her hand below the surface, feeling the smooth underbellies of the rays as they grazed her palms. Larson smiled, feeling lucky to be doing what she had dreamed about as a kid. 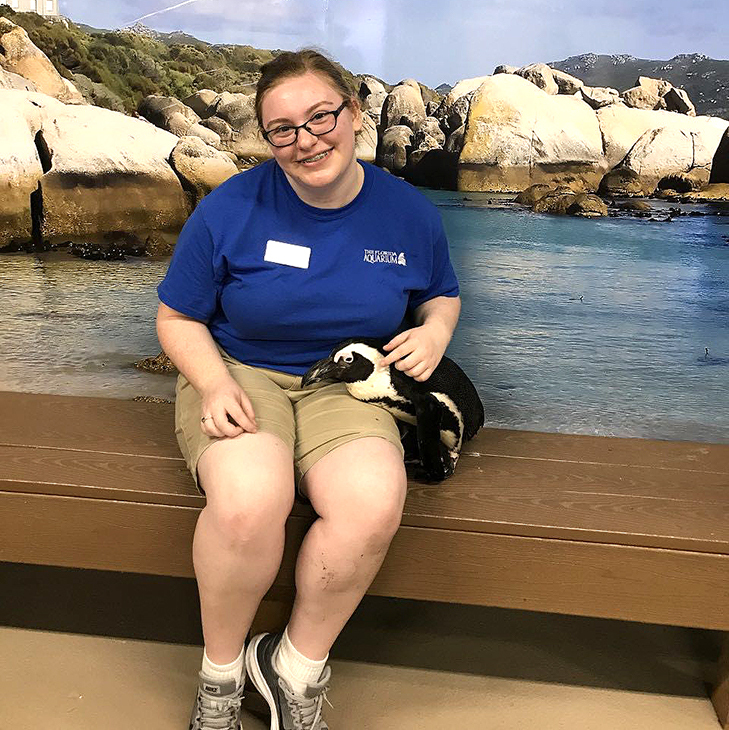 This spring, Jess Larson ’21 joined the Animal Ambassadors’ Team at the Florida Aquarium in downtown Tampa. This spring, Larson joined the Animal Ambassadors’ Team at the Florida Aquarium in downtown Tampa. In this position, she cleans habitats, cuddles with penguins and swims with sting rays, among other responsibilities. As a first-year student at The University of Tampa, Larson took a Pathways to Honors course in the fall of 2018 where she was required to work a number of volunteer hours. 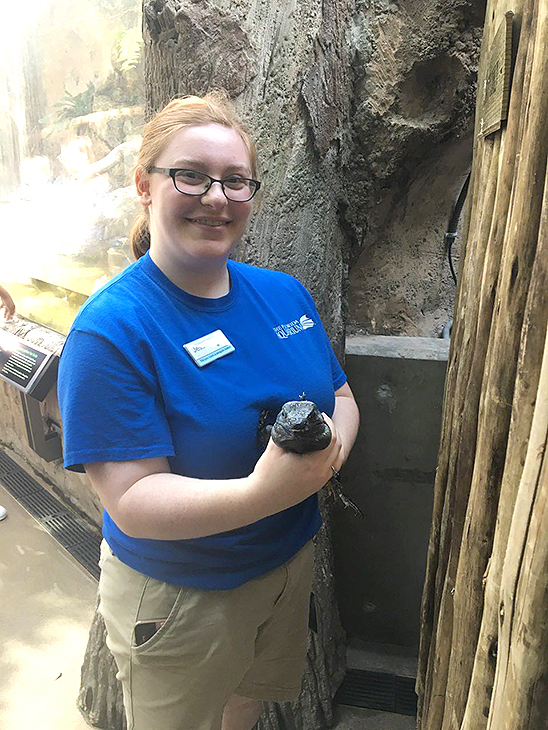 “I didn’t plan on working with an aquarium for another few semesters, but my class really pushed me to reach out to the Florida Aquarium right away, and I’m so happy I did,” said Larson, who began volunteering in November, where she was responsible for preparing food for the birds. In addition to cleaning and caring for many of the aquarium’s animals, Larson is involved in a new program as well, the Handling Program. In this program she’s learned how to hold and handle animals. In addition to cleaning and caring for many of the aquarium’s animals, Larson is involved in a new program as well, the Handling Program. In this program she’s learned how to hold and handle animals, including the rare Mexican Spiny Tailed Iguana. She now holds a selection of animals, displays them to visitors for meet and greets, and educates and answers any questions. Larson said she wants to be involved with the Florida Aquarium for as long as possible and as much as she can throughout her years at UT.